You don't have to shove your way into long lines to get great deals on holiday gifts this year! Several Etsy shops are offering discounts from Black Friday through Cyber Monday. Or if you'd rather relax and spend time with family this Thanksgiving weekend, just check out the Saturday Night Specials team any Saturday of the year after 5 p.m. for coupon codes and markdowns. Rosi of Illusion Creations featured pretty presents by her teammates that are sure to bring joy to a loved one's face. 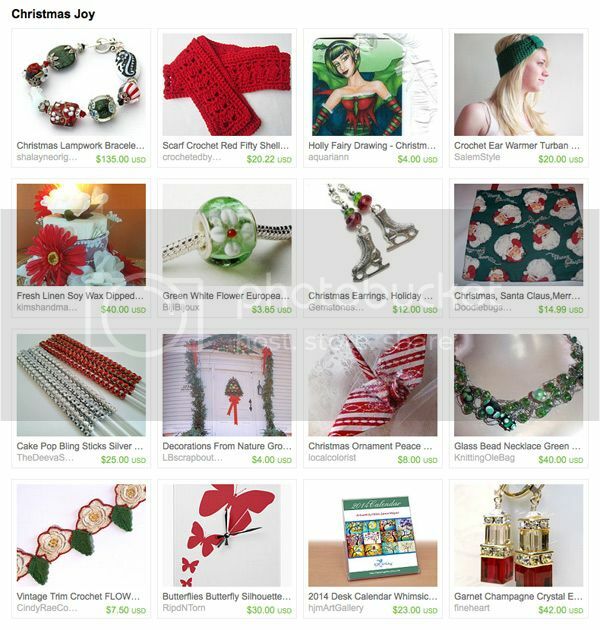 Christmas gift ideas for women include Christmas lampwork bracelet by ShaLayne Originals, peace crane Christmas ornament by Nancy McNally and my holly fairy bookmark. Are You Getting Ready for Christmas? Sorry for leaving my name instead of treasury name:) I hope you will correct it or excuse me! Fixed! Thank you so fairy much for playing. Thanks for the invite! This is great. I really like your layout too.